Housing and the Welfare State . So this took me some time to read — housing policy is such important stuff but not exactly gripping. Took me longer to blog, as work is life crushing at the moment. I always wonder really why I am drawn back to housing over and over again. Still. This made me see Britain in rather a different way, not having much delved into histories of the welfare state. I am glad I read it before a number of others that all refer to it, but don’t engage in the same kind of structural analysis that I value so much. It is widely refered to, though rarely with full agreement. I would say that markets, at least in our times, are always politically created, what else underpins contracts, ownership, property? But I digress. Malpass describes himself as broadly in agreement with the academic literature in how it periodizes the welfare state: two main periods (pre and post 1988), but also recognising the difference between the postwar consensus and shared principles around welfare state, the mid 1970s watershed and its redefining and renegotiating of the welfare state, and then the 1980s and the work to re-engineer (and destroy) the welfare state as a whole. social: which is centered around the push for full employment — though of course this would be full white male employment and he describes the ‘gendered, patriarchal and racialized nature of the postwar British welfare state.‘ (9-10) where the ‘Universalism of the welfare state was, in fact, deeply circumscribed’. (10) So even in the good old days, it wasn’t good for over half of us. Now? Changing patterns in households, much more diverse, more two-earner households, and no-earner. More pensioners. Old assumptions of white male breadwinners no longer work, but nothing has replaced it really. And of course the welfare state required full (male) employment, without it, things become very expensive. I’m not sure where that leaves us. least decommodified and the most market-determined of the conventionally accepted constituents of such states. Thus, while housing was something we did fight for and that we did win, when provided it was always for the better-off working classes until the 1970s. Only then did it become ‘residualised’. Where it had once started out being for the better off, it is now for the worse off, and brings with it all the stigma and social exclusion that such an obvious connection between tenure and the many dimensions of poverty can bring. While there have been step changes to manage the housing market, there had been no challenge to hegemony. He argues that it is significant that large scale provision of housing came only after the crisis in the housing market affected a large proportion of the working class. In this, housing policy has always worked to support the market, not challenge or replace it. For much of the twentieth century, this meant slum clearance, and building subsidized housing. For the latter end of the century, it moved to helping better off working class into their own homes, the least well-off into social housing. Blair just followed along this trajectory. Step changes might have been made to manage the market, but no challenge to hegemony. 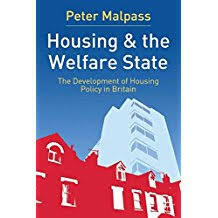 Malpass, Peter (2005) Housing and the Welfare State: The Development of Housing Policy in Britain. Basingstoke: Macmillan.